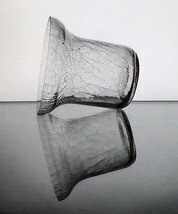 Hanging Candle Bowl in clear crackle glass - Measures 5.75 inches h X 5.5 inches w. at the top rim. 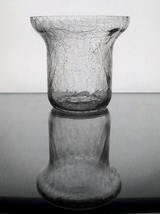 For use with votives or small pillars or flowers if used as a vase. Flared rim at the top. Suitable for use in a wall holder or metal frame with a 4.25 - 4.75 inch ring. Holder has a flat bottom and can sit freely on it's own as well. 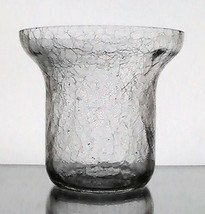 Hanging Candle Bowl in clear crackle glass - Measures 5.5 inches h X 5.75 inches w. at the top rim. For use with votives or small pillars. Flared rim at the top. 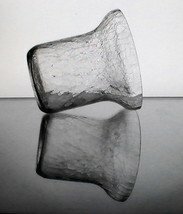 Suitable for use in wall holder or metal frame with a 4.25 - 4.75 inch ring. Holder has a flat bottom and can sit freely on it's own as well. 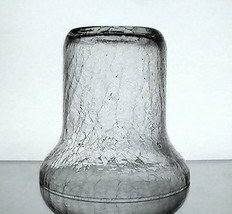 For Customer Reference: How to measure for a replacement hanging candle holder or vase. Measure the inner diameter of the support ring, it is referenced in all listings.